“A Promising Future of Hong Kong” Photo Competition Award Ceremony & Seminar was held on 25th August, 2018 at the sky lobby of AIA Central. Guests who have attended the event including Mr. Parkes Lee, Head of Property Investment Department, AIA Group, Mr. Julius Lau, Chief Executive Officer of Lai Sun Development Company Ltd., Mr. Andrew Wells, Deputy Chief Executive Officer of Por Yen Charitable Foundation, Mr. Edward Wan, Director of the Por Yen Charitable Foundation, the two professional judges Mr. Gilbert Yu and Ms. Weng Lien-fen, Mr. Tso Tat Ming, Principal of YCH Lim Por Yen Secondary School, Teachers and students from YCH Lim Por Yen Secondary School. The two Professional photographers, Mr. Gilbert Yu, Founder of PhotoTop10 Institute and a fine art, black and white photographer, and Ms. Weng Lien-fen, Honorary Life Advisor of the Photographic Society of Hong Kong who specializes on landscape, nature, exotic and wildlife photography, shared their experience in photography during the seminar. They also outlined the criterion in selecting the winners and their advice to all participants of the competition. 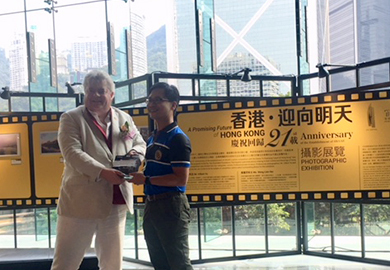 As such event has gained wide acclaim last year, Por Yen Charitable Foundation continued to sponsor “A Promising Future of Hong Kong” Photo Competition to celebrate the 21st Anniversary of the Establishment of HKSAR. Through the camera lenses to capture the beauty of our city and wishing Hong Kong to have a promising future. The competition was divided into two categories, namely, Professional and Amateur. A total of 21 awards were presented to Champion, First and Second runner-up, winners of Merit award, Accreditation award, and “My Favorite photo” chosen by Facebook fans of each category. An exhibition of all award winning photographs starting on 6 August, 2018 will continue to be open to the public until 31 August, 2018. Please click here to view the award winning photographs of “A Promising Future of Hong Kong” Photo Competition.